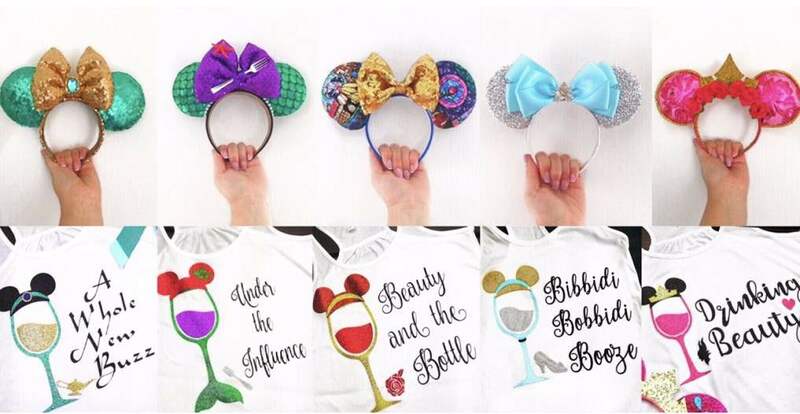 One of the most fun parts of planning our Disney wedding has been choosing Disney themed gifts for my bridesmaids! A Disney wedding is such a unique event, and there are so many ideas that will jump start your wedding party’s Disney trip. I chose six gifts to give to my bridal party throughout the wedding planning that I absolutely adore! Here are my favorite items. Many of the girls in my bridal party did not realize how fun it can be to dress up in the parks with “Disney style!” When I asked my friends to be my bridesmaids, I gifted them black “Bridesmaid” shirts, with gold Disney font of course, and matching ears we can all wear together when we are celebrating in Magic Kingdom after the wedding! Our wedding colors are ivory and gold and the bridesmaids are wearing gold sequin dresses, so gold plays a role in many of their gifts. The day after the wedding we will all be together in Epcot for the food and wine festival, so I thought it would be fun to rock matching Disney princess themed “Drinking around the World” shirts based on the girls’ favorite Disney princess. Plus I found matching ears to go along with them! 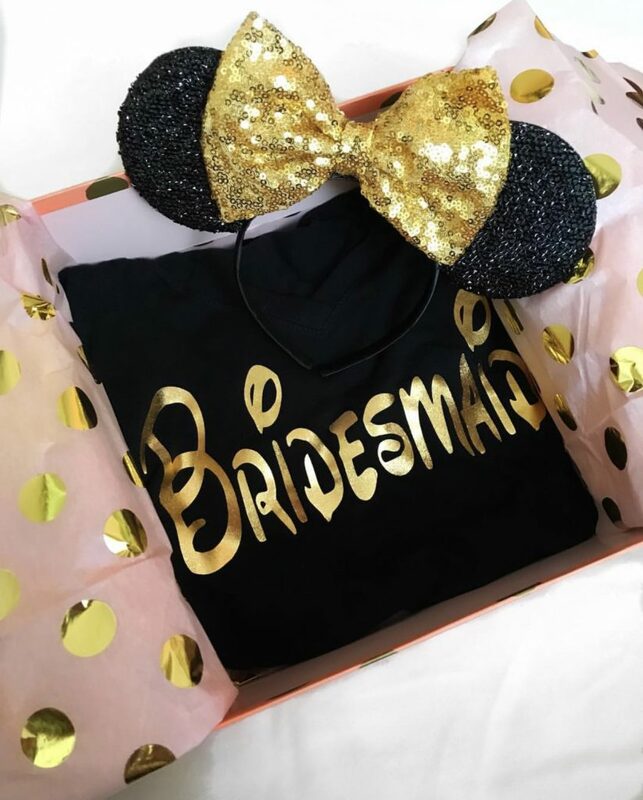 Disney shirts with matching ears are such a fun way to get your bridesmaids enthusiastic about their role in your Disney wedding, and their own Disney trip, especially if you will all be together in the park. We are all so excited to wear our Disney shirts and matching ears on the wedding trip! Many of my bridesmaids are new to Disney and had no clue what celebration buttons or Magic Bands were, let alone how fun they can be! Along with the Disney princess themed shirts and matching ears, I also got them “Bridesmaid” celebration buttons featuring their favorite Disney princess! In addition I will be giving them “Bridesmaid” decals to accessorize their Magic Bands! 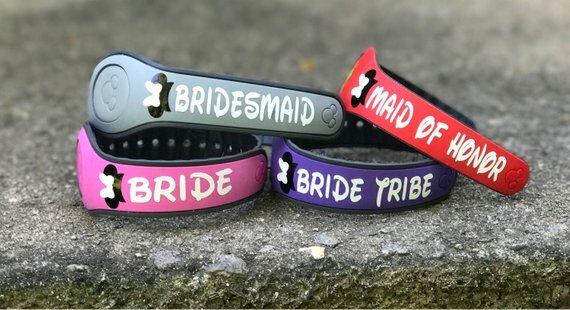 We are so happy and lucky that all of our bridal party will be joining us in the park the days following our wedding and will continue the celebration with us wearing these fun Disney accessories! This jewelry isn’t exactly a “Disney” themed gift but I think it’s a special token of appreciation for the bridal party to show gratitude for all of the things they have done for you leading up to your wedding. For our wedding my girls are all wearing gold sequin gowns, each with a different neckline that they chose. I decided that all of the girls gowns would look beautiful with gold earrings and a bracelet to go with them! When I was considering jewelry, I knew I wanted to get the girls something nice, that they could wear again on special occasions, but of course I had a budget to stick within. I decided to look at Swarovski because they have jewelry that is beautiful but affordable! 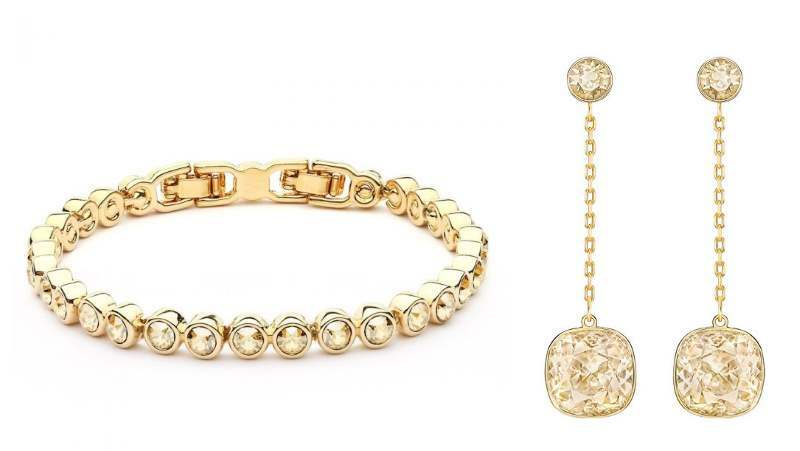 I picked out gold plated earrings and a matching gold plated tennis bracelet for the girls to wear on the wedding day. Hopefully after the wedding, whenever they wear this jewelry again, they will always be reminded of how appreciative I am that they were with me on our special day! What better way to get ready with your girls the morning of your wedding than relaxing in matching robes! I’ll be giving the robes to my girls on the morning of the wedding. I love the idea of everyone matching and getting some cute bridal party pictures together while we are getting ready. 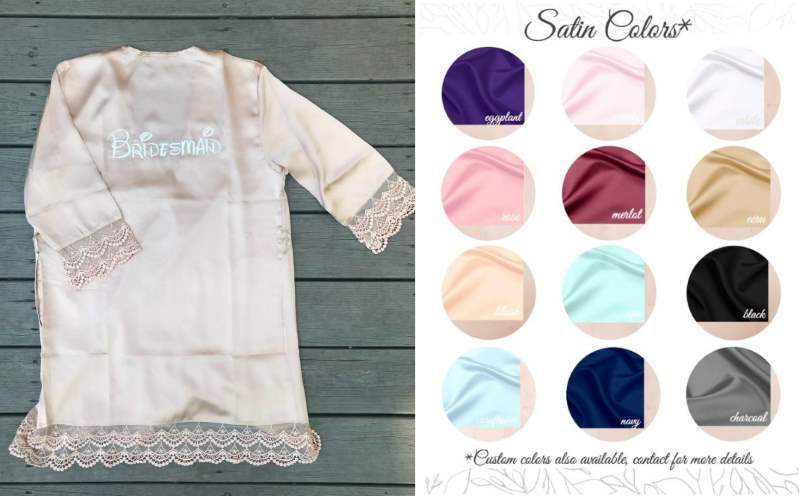 I purchased satin “Maid of Honor”/”Bridesmaid” robes for each of my girls, using Disney font of course. The robes are ecru and have lace on the sleeves and along the bottom. I purchased these robes from SageLoveDesigns, an Etsy store, and I was happy to find that they were such great quality since sometimes ordering online can be risky! SageLoveDesigns has so many colors and robe styles to choose from. I was also so happy to hear they could do the robes with Disney font! My Bridesmaids and I are shipping our gowns down to Orlando early to have them steamed and delivered the night before our wedding. I thought a fun way to display the dresses and show the girls their gowns all ready to go was by presenting them on fun Disney themed hangers! I purchased each bridesmaid a white hanger that has “Maid of Honor”/ “Bridesmaid” and a Mickey head in the wiring! It also says their name and the date in gold Disney font with a Mickey and Minnie image in the center. I love these hangers! They are a perfect way to display the girls dresses, and get some fun pictures on the wedding day! I wanted to get my girls a bag that they could put all of their stuff in so we could stay nice and organized while we are getting ready on wedding day. I decided for the bag to stay away from a wedding/Disney themed bag so it is something they can use over and over. 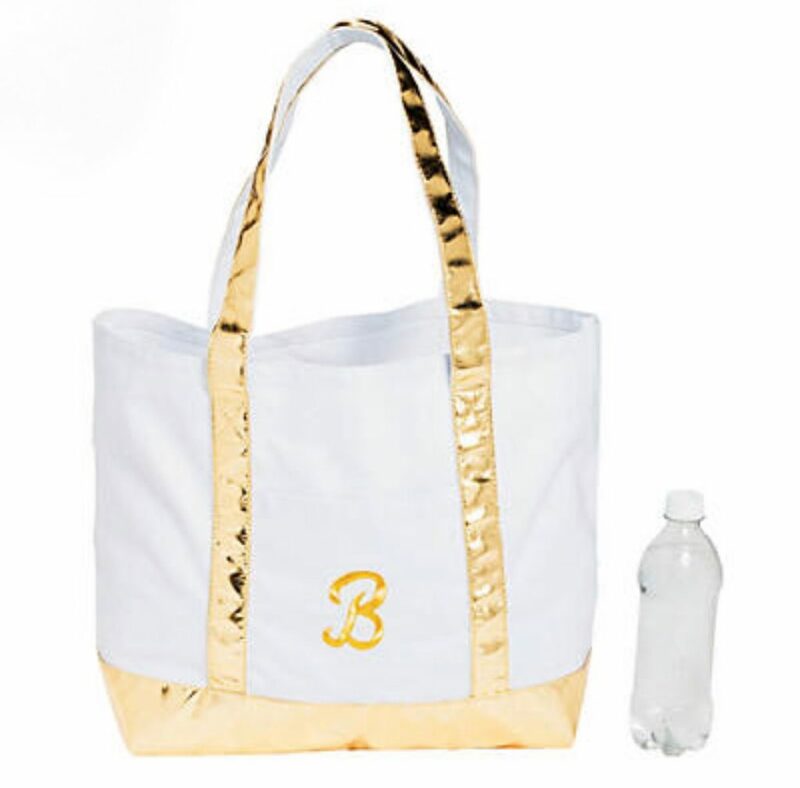 I decided on a white tote bag with gold accents, and a gold monogram of their first initial on it. This bag goes perfectly with the wedding colors and is super cute, and can be used again and again after the wedding! 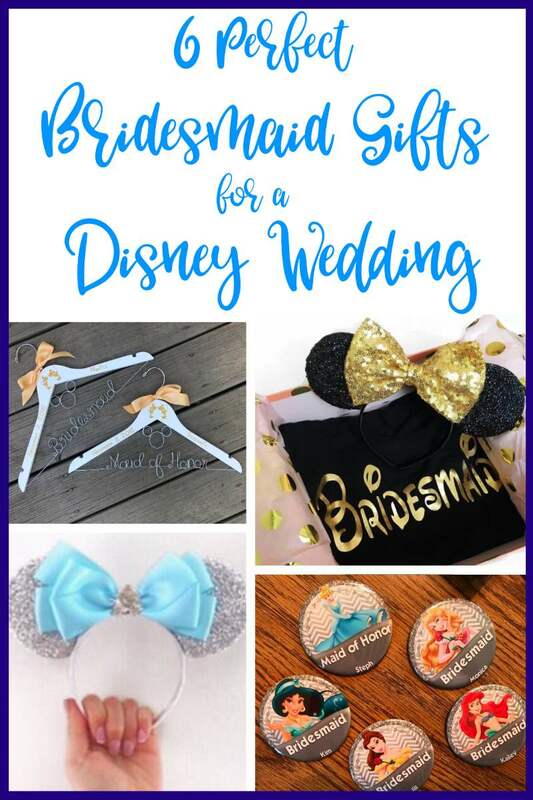 I think these six gifts are just right for Disney bridal parties! 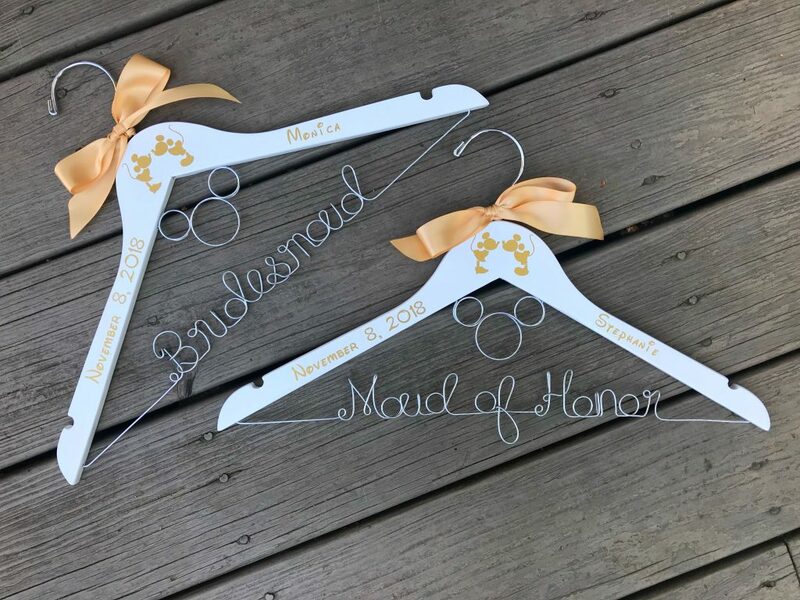 They are the perfect mix of Disney fun and items the girls can use to remember that they were such an important part of the most special day of my life!